Net2Phone is a diversified communications company that sells calling cards as well as other related products. This is a wider scope of products than most calling card companies offer, but this isn't as impressive as it might seem. First, the products are not well integrated - they are largely sold and supported individually. Second, the PC-to-phone and PC-to-fax apps are very dated and only work on older versions of Windows. Third, there is no mobile dialing app. Since an increasing number of vendors now offer both PC-to-phone and mobile dialing apps that are well integrated into their calling card products, Net2Phone is clearly falling behind the competition in some ways (even though they seem to have more offerings). Net2Phone is a subsidiary of IDT, one of the largest international VoIP carriers in the world. IDT is a publicly traded company listed on the New York Stock Exchange. It provides local, long distance, and calling card services. In addition to Net2Phone, IDT also operates two other calling card businesses: PennyTalk and Union Telecard Alliance. Net2Phone is an 'integrated provider' because all Net2Phone calling card minutes are carried directly IDT's global communications network. This contrasts with how calling card resellers work where their call minutes are carried by a 3rd party carrier, not the reseller. In general, we recommend integrated providers over resellers, although you can get very good cards from either type of company. IDT's PennyTalk subsidiary is also an integrated provider. Pingo, a company we rate more highly than Net2Phone, is another integrated provider. Net2Phone Direct, the part of Net2Phone that offers calling cards, sells a single calling card with a comprehensive rate plan that covers locations worldwide. The company has hundreds of local access numbers in the US and about a dozen in Canada. Like the PennyTalk card, the Net2Phone card also can be used from over 30 countries worldwide via toll-free access numbers. Via the PC2Phone product, Net2Phone does offer a PC dialing app (aka 'softphone'). This has its own rate plan. Net2Phone does not offer a mobile dialing app for use on iPhone, Blackberry, Android, or other phones. Net2Phone pricing prices are quite high. As an example, we checked Net2Phone per minute rates from the US to the UK and they were 5¢ per minute when other quality cards are charging 1¢ to 2¢. They also tack on 3¢ per minute when you use their toll-free numbers (industry norm is more like 1¢) - no extra charge for using the local numbers. They also have a US$25 minimum purchase. Overall, you'll find many other reputable cards that beat Net2Phone prices. Also of concern is that IDT has been involved in several lawsuits brought by federal and state authorities in the US against companies in the calling card industry. These suits had to do with deceptive marketing and pricing practices. Two were settled as recently as 2009. IDT seems to have mended it ways since then and become a model citizen. While Net2Phone.com has some positive qualities (international voice network, customer service, wide range of services), the prices for their calling card softphone are on the high side. The softphone is also badly outdated and works only on older Windows operating systems (not Vista or Windows 7). You can easily find better value elsewhere (see any of our top picks). Overall, we give them a 'qualified buy' rating and recommend that you consider other options. Summary Net2Phone is a diversified telephone company that sells various phone services, including calling cards, to consumers and small businesses. They also operate a wholesale business that sells services to cable companies and others. The main consumer offerings are: broadband phone service, calling cards, PC-to-phone service, PC-to-fax service, virtual local numbers, and monthly calling plans. This review focuses on the calling card and PC-to-phone offerings. Net2Phone sells a single calling card with a comprehensive rate plan that covers all locations worldwide, including call origination points from 30 countries worldwide. Net2Phone rates are at the high end for the industry and they have a $25 minimum purchase requirement. All Net2Phone calling card minutes are carried by IDT, their parent company, which operates a global VoIP communications network. Parent Company Net2Phone is owned by IDT which operates an global VoIP telephony network. IDT is a well established company that trades on the New York Stock Exchange. IDT has been cited in lawsuits by US and state governments against companies in the calling card industry. In settlements reached in 2009, it pledged to end all deceptive marketing and pricing tactics. It appears to have fulfilled that pledge. Net2Phone rates are well above prevailing industry rates. As an example, in a recent check we did the Net2Phone calling card per minute rate from the US to the UK was 5.00¢ per minute when other quality cards are charging 1¢ to 2¢. We were surprised to find that the Net2Phone PC2Phone (softphone) rate was virtually the same at 4.90¢ per minute - you would expect a considerably lower rate. Net2Phone charges an extra 3¢ per minute when you use their toll-free numbers in the US (industry norm is more like 1¢). Net2Phone charges a $1.49 monthly maintenance fee and 90¢ for calls from payphones. It does not charge a connection fee. Net2Phone tacks on fewer extra fees than some cards, but they aren't as clean as the best. What gets them a demerit here is high toll-free access charges in the US. Net2Phone is not a reseller and so it does not not sell lots of different cards. Instead, it sells only 1 calling card with a comprehensive rate plan for all locations it serves. This keeps things simple and we like that. Net2Phone does a good job of disclosing all its rates and fees. The main Net2Phone pricing elements are: per minute rates, toll-free surcharges (3@cent per minute for US numbers), a $1.49 monthly maintenance fee, and 90@cent payphone surcharge. IDT has been cited for poor disclosure in the recent past, but their current practices seem ok now. All Net2Phone calls are carried by IDT, their parent company. IDT is a well established global communications provider. We strongly prefer calling card companies that carry their own traffic - it leads to less finger pointing if something goes wrong. It also generally indicates you'll get higher call quality and reliability. The Net2Phone.com website is a bit of a mess and it feels somewhat dated compared to some newer competitors. With all the different Net2Phone offerings, we find it confusing to figure out what's what. It would be easier if the products were somehow more integrated and pulled together. As well, some offerings are very poorly described - e.g., PC2Phone. If you don't already know what a softphone is, you'll have no idea what this is. 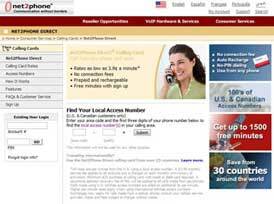 Net2Phone.com provides customer support via phone and email. Phone lines are open 12 hrs a day during the work week and 8 hrs a day on weekends. In several test calls we made, we got quick pick-up by a service rep, but the quality of their support was mediocre. In the US, Net2Phone provides hundreds of local access numbers. In Canada, there are about a dozen local access numbers. Toll-free numbers are available in about 30 countries, including the US and Canada. Local number usage is free. US toll-free numbers carry a surcharge of 3¢ per minute in the US. Non-US toll-free numbers have no surcharge. If you go back a year or so (2009), you will find that Net2Phone's parent company IDT was cited in a number of legal actions for deceptive calling card marketing and pricing practices. They appear to have since cleaned up their act and become a model citizen since then. In other words, maybe they deserve 'green' for their current behavior, but the dicey history is recent enough that it makes us cautious. As an integrated operator, Net2Phone should be able to offer much more innovative features than they do. The lack of a mobile app and a very dated softphone app suggests they are no innovating like other calling card providers. Net2Phone's return policy is to refund any remaining balance in your account. This is fairly typical in the industry. Net2Phone is not strong on the incentives front. There are no referral bonuses and no first-time customer deals. There are some volume bonuses (e.g., spend $100, get 500 free minutes), but these are nothing to write home about compared to some other companies (e.g., Pingo). We don't recommend Net2Phone.com. Despite having some outstanding features, Net2Phone gets our 'qualified buy' rating. The main problem is their high per minute rates. You can easily find better prices from any of our top picks.